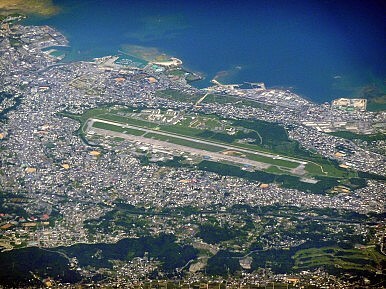 The US base at Futenma in 2010. Governor Takeshi Onaga makes good on a promise to exhaust every means to halt the base construction. The Okinawa basing issue is officially back in the spotlight, as prefectural governor Takeshi Onaga revoked the local government’s permission for construction on a new U.S. base in Henoko. Now it’s official: Onaga has revoked the permission, which will likely set up a string of legal battles between the local and central governments. Tokyo has pledged to complete the Henoko base construction, and will likely seek to have the courts overturn Onaga’s move to rescind permission for construction. “The Defense Ministry finds that there was no legal flaw with the reclamation permit and our position remains the same: Governor Onaga’s revocation measure is illegal,” Japan’s defense minister, Gen Nakatani, said. According to Asahi Shimbun, the central government will file a complaint to a government ministry under the Administrative Appeal Law; Onaga is expected to fight that in court. Onaga (and many other Okinawans) believe that their prefecture has to bear too much of the burden for hosting U.S. troops in Japan. Onaga hasn’t been shy about making his case; he visited the U.S. to talk with American officials about his prefecture’s stance in June. Onaga even went before the UN Human Rights Council on September 21 to argue that the base construction was a human rights violation. “Can a country share values such as freedom, equality, human rights and democracy with other nations when that country cannot guarantee those values for its people?” Onaga asked. Japan’s central government was not pleased. Chief Cabinet Secretary Yoshihide Suga told reporters he was unhappy with the speech, according to Kyodo News. Though Onaga promised in his UNHRC speech“to stop the new base construction using every possible and legitimate means,” in the end his options may be limited. The central government already succeeded in overturning an ordered work stoppage issued from Onaga on environmental grounds. And ultimately, if Prime Minister Shinzo Abe is determined to complete the base – which has been in the works for nearly 20 years – he could enact a Special Measures Law that would override the local government’s authority, as Yuki Tatsumi explained for The Diplomat. Still, Onaga can make the basing issue as politically costly for Abe as possible – and he seems determined to do so. Okinawa Governor Onaga has moved to rescind the central government's permit to construct a new U.S. base.